Mitosis produces two cells with the same number of chromosomes as the parent cell. Mitosis of a diploid cell (2n) produces two diploid daughter cells. If two diploid cells went on to participate in sexual reproduction, their fusion would produce a tetraploid (4n) zygote. Fusion of two such cells produces a 2n zygote. Used to produce spores. Spores are the start of the gametophyte generation which, in time, will produce gametes (by mitosis because the starting cells are already haploid). Prophase of meiosis I (prophase I) is a more elaborate process than prophase of mitosis (and usually takes much longer). Here is a brief overview of the process. A more detailed view is provided below. When the chromosomes first become visible they are already doubled, each homologue having been duplicated during the preceding S phase. 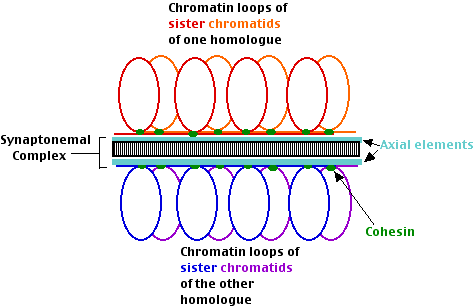 Result: pairs of homologous dyads each dyad consisting of two sister chromatids held together by a protein complex called cohesin. Pairing: Each pair of homologous dyads align lengthwise with each other. one or more chiasmata (sing. = chiasma) which form between two nonsister chromatids at points where they have crossed over. sister kinetochores of the other homologue pulling those sisters toward the opposite pole. Result: one homologue is pulled above the metaphase plate, the other below. The chiasmata keep the homologues attached to each other, and the cohesin keeps the sister chromatids together. the chiasmata to slip apart. Result: the homologous dyads separate and migrate toward their respective poles. Link to discussion of the mechanism of cohesin breakdown. Chromosome behavior in meiosis II is like that of mitosis. At metaphase II, spindle fibers attach one kinetochore of the dyad to one pole, the other to the opposite pole. At anaphase II, the chromatids separate and (each now an independent chromosome) move to their respective poles. Meiosis is a dynamic process. Link to John Kyrk's excellent animation of it. Meiosis not only preserves the genome size of sexually reproducing eukaryotes but also provides three mechanisms to diversify the genomes of the offspring. Chiasmata represent points where earlier (and unseen) nonsister chromatids had swapped sections. The process is called crossing over. It is reciprocal; the segments exchanged by each nonsister chromatid are identical (but may carry different alleles). Each chromatid contains a single molecule of DNA. So the problem of crossing over is really a problem of swapping portions of adjacent DNA molecules. It must be done with great precision so that neither chromatid gains or loses any genes. In fact, crossing over has to be sufficiently precise that not a single nucleotide is lost or added at the crossover point if it occurs within a gene. Otherwise a frameshift would result and the resulting gene would produce a defective product or, more likely, no product at all. Link to a model of how two DNA molecules can cross over. Crossing over between two DNA molecules carrying different alleles enables the order of genes to be mapped. Follow these links to see examples. In the diagram above, only a single chiasma is shown. However, multiple chiasmata are commonly found (in humans the average number of chiasmata per tetrad is just over two). In this photomicrograph (courtesy of Prof. Bernard John), a tetrad of the grasshopper Chorthippus parallelus shows 5 chiasmata. In meiosis I, the orientation of paternal and maternal homologues at the metaphase plate is random. Therefore, although each cell produced by meiosis contains only one of each homologue, the number of possible combinations of maternal and paternal homologues is 2n, where n = the haploid number of chromosomes. In this diagram, the haploid number is 3, and 8 (23) different combinations are produced. Random assortment of homologues in humans produces 223 (8,388,608) different combinations of chromosomes. Furthermore, because of crossing over, none of these chromosomes is "pure" maternal or paternal. The distribution of recombinant and non-recombinant sister chromatids [View] into the daughter cells at anaphase II is also random. So I think it is safe to conclude that of all the billions of sperm produced by a man during his lifetime (and the hundreds of eggs that mature over the life of a woman), no two have exactly the same gene content. By reducing the number of chromosomes from 2n to n,the stage is set for the union of two genomes. If the parents differ genetically, new combinations of genes can occur in their offspring. Taking these three mechanisms together, I think that it is safe to conclude that no two human beings have ever shared an identical genome unless they had an identical sibling; that is a sibling produced from the same fertilized egg. The behavior of chromosomes during meiosis (2n → n) and fertilization (n + n → 2n) provide the structural basis for Mendel's rules of inheritance. Link to discussions of Mendel's monohybrid and dihybrid crosses. The lengthy and complex events of prophase I can be broken down into 5 stages. Pairing. Homologous dyads (pairs of sister chromatids) find each other and align themselves from end to end with the aid of an axial element (that contains cohesin). In budding yeast (and perhaps other eukaryotes) the process follows a period of trial-and-error. Any two dyads pair at their centromeres. If they are not homologs, they separate and try again. How the nonsisters recognize their shared regions of DNA homology is uncertain. Double-stranded breaks (DSBs) often occur in the DNA of the chromatids, and these may be necessary for the homologs to recognize each other. Synapsis. The synaptonemal complex begins to form. DNA strands of nonsister chromatids begin the process of recombination. How they are able to do so across the synaptonemal complex, which is over 100 nm thick, is unknown. Recombination nodules appear (at least in some organisms, including humans). They are named for the idea that they represent points where DNA recombination is occurring. There must be at least one for each bivalent if meiosis is to succeed. There are often more, each one presumably representing the point of a crossover. The steps in recombining DNA continue to the end of pachytene. Link to a model of how two DNA molecules can recombine segments. The synaptonemal complex begins to break down. chiasmata. At first the chiasmata are located at the sites of the recombination nodules, but later they migrate towards the ends of the chromatids. In some organisms, the chromosomes decondense and begin to be transcribed for a time. This is followed by the chromosomes recondensing in preparation for metaphase I. In creatures where this does not occur, the chromosomes condense further in preparation for metaphase I. Any failure that is detected stops the process and usually causes the cell to self-destruct by apoptosis. However, despite these checkpoints, errors occasionally do go uncorrected. It is estimated that from 10–25% of all human fertilized eggs contain chromosome abnormalities, and these are the most common cause of pregnancy failure (35% of the cases). become more frequent as a woman ages. Zygotes missing one chromosome ("monosomy") cannot develop to birth (except for females with a single X chromosome). Three of the same chromosome ("trisomy") is also lethal except for chromosomes 13, 18, and 21 (trisomy 21 is the cause of Down syndrome).